All work and no play…. and was glad I did.. 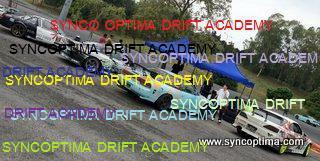 This entry was posted in Drifting, Sync Optima Events, Track, Yon-A on July 25, 2009 by skagee. Cheaka and I had the pleasure of teaching the a group of Singaporean the art of drifting in Nusa Jaya Johore last weekend. We rounded the ‘usual suspects’ of cars and trailed them down south for the one day lesson . In attendance were also a mother and son team, Roslyn and Ben whom I had the pleasure of meeting ealier during the Formula Drift roadshow in Singapore last month.15 year old Ben is our youngest student to date ,whom by the end of the day even managed to impress Heng from Drift Garage with his newly acquired drifting skills! Definately a talented bunch of people who I hope will take the sport seriously in the near future!! This entry was posted in Drifting, Goodyear, SODA, Sync Optima Events and tagged drift, drift academy, Drifting, johore, malaysia drift, singapore drift on July 23, 2009 by skagee. We decided to leave to Singapore a day earlier,as we had to be at the track at 12pm the next day and we wanted to settle some logistics matters and meet a few people before that.. We managed to timed everything to perfection but was held back by the decal shop fiasco which I shall not elaborate here. We finally got to Singapore at 8pm which was already too late to do anything . So we decided to check in , grab something to eat and call it a night..
We arrived at the track at 10am. The course looked intimidating damn scary, especially with the concrete walls lining the entrance of the track. What worried me the most was the man hole cover that causes cars to unsettle mid way through the first outer clipping point. Ivan Lim , Cheaka and I all had our cars pointing straight mid drift during the media promo day, which had us plowing straight through the cones lining the outer track . Those cones are now being replaced by concrete walls which I am certain would not be as forgiving .. The stunt show rehearsal ,scheduled today,was canceled due to a few drivers involved were not being able to arrive today. So instead ,we did our drift taxi ride practice. To keep it fair to the other drifters, we were no allowed to practice on the full course and and not use the official starting point ,we were instructed to begin our runs mid way through the first corner. As the organizers and sponsors were watching us practice, so it was also a rehearsal as they would hate for any unpleasant surprises to happen tomorrow. Cheaka , Yoong , Sean and I only got about 4 runs each before it started to rain heavily. So we decided to call it quits. It was about that time the Goodyear Thai drivers arrived. We helped them unload and just hung out where I got the chance to brush up on my Thai-glish. Pop’s ‘SR20 powered Rx8 faced’ Mx5!! Both of the Thai drifters cars were only recently completed. It was unfortunate they suffered mechanical trouble throughout the weekend as they were certainly a force to reckon with in Singapore this year! Thai pop star looking , Nakorn (yellow T shirt) checking out the installation of the side impact bar on his Soarer. Media day!!! We arrived at the track at 8am and promptly got suited up. All the drivers representing Goodyear were present for the press conference .Thailand , Malaysia , Singapore and Hong Kong were all represented!
. We were then brought out to the track and gave the media taxi rides out on the track.. It was all fine a till I arrived back to the pits. Leong comes up to me and says ” Bro, I got bad news! !” The first thought that went through my mind was that I have some mechanical trouble or even worse ,blown my engine again. He then informed me that they had allocated the wrong tires to me!!! This came to be a big blow as I had used what little tires that we brought over from Malaysia and the tires that we got for Cheaka which were too narrow ( width) for me.It is not uncommon for stuff like this to happen on an event as large as this ; tyres were being allocated and distributed to all the Goodyear drivers and a minor glitch such as this is bound to happen. Marcus, bless his soul, tried his best to resolve the situation by getting Yoong to agree to give half of his allocation to me ( Thanks Yoong ) but with stunt shows , taxi rides and practice runs coming ahead, I knew they were not enough. So I decided to use Cheaka tires instead ..Hell, I made it through last year with three cylinder, I reckon running on narrow rears won’t be much of a trouble especially since they were Goodyear RevSpecs, which is known to be grippier when comparing with other brands of the same tyre width . However, it will a bit difficult if it rained as the physical size and width does play an important role when it comes to grip in the wet . I just brushed the thought off and was glad the engine is still running fine! We were all nervous about the concrete barrier that lined both the outer clipping points and the fact that the man hole cover that tend to throw our cars out of line didn’t help either.Though the reduced grip level was apparent , I got used to running on Cheaka’s tyres after a couple of runs.Both of us took conservative lines during our runs and we managed to keep our cars in one piece for the first practice session. Cheaka was nailing all her runs and managed to impress the Formula D judges Andy Yen and Tony Angelo! We did two stunt shows per day where we all took turns ‘challanging’ Mattie on his bike ..Yoong definately stole the show with his rodeo move!!! On practice session two it began to rain!! Practice was held up for a moment in order for the track to dry up.When they finally did let us off on the track , it was only partially dried up with wet patches dotting around the course. This made the grip level varied through out the course .The tires on my car performed exceptionally well but I had to dramatically change my driving style to suit the slippery condition. During this session ,Cheaka was unlucky as she drifted over one of those slippery wet patches which caused her to spin and rear end on to the concrete wall at the second rear clipping zone .To stiffen Cheaka’s car, besides the roll cage, we had mounted a brace at the rear of the car which connects the rear chassis to the rear suspension tower. The force of the impact of the crash had caused the brace to move the tower thus causing her right rear absorbers and rear wheel knuckle .to move almost and inch forward!! She was struggling with the car throughout the session after the incident! Upon requesting, I was allowed to test drive her car found that the car was experiencing under steer each time it was drifted to the left. As we didn’t have the right tools to straighten out the chassis and tower neither did we want to risk adjusting the rear caster and making it worse, I suggested that she just increase the rear tire pressure to reduce the understeer and try to adapt to it. Many Singaporeans in attendance were interested in the sport and many were eager to get involved. With Binter and Formula Drift Holdings continuing paving the path, I’m sure we will be getting more Singaporeans participating next year!! Competition day!! We were all buzzing from excitement as this is the day that we were waiting for!! 37 drifters top drifters from Singapore, Malaysia, Thailand, Hong kong, China and Indonesia going head to head against each other! Practice was good and I basically went 7/10 after seeing Ivan Lau’s crash on his first run. Thankfully Ivan managed to get his car fixed in time for qualifying. Qualifying was a straight forward affair. I did what I thought was one of my best run on the track but was really disappointed when informed that I had 74.5 points on my run. I got out of the car , took off my helmet and gloves of and just sat on the curb . Back in Malaysia with a score like that you might not even make it to top 16. However , amazingly my score remained highest till it was qualifying round 2!! By the end of round 2, my score was ranked third highest behind Tat Wei and Djan! It was a huge shock to find out that Ivan Lim failed to qualify. Based on his practice runs ,he was definitely one of the favorites for the weekend. However, situation like this do happen and it was unfortunate to have happened to someone who is a good as Ivan. I am sure his luck would be better for the up coming rounds!! I was paired of with Shah from Singapore. An aggressive drifter which I know will be a tough fight during tsuiso. Since I qualified 3rd ,my battle with Shah would be the 7th pairing. So I decided to chill out in the car and poke fun at Jenshen (RyuK1d) who was my umbrella boy :). To my horror it started to rain!!!! Aww man!! Images of me spinning out during entry started to flash in my head!!! They had to stop the tandem battle to wait for the rain to stop. When the rain begin to ease off a bit,they sent us out in a group to help dissipate any standing water on the track. The track however appeared to be alot wetter than the day before! I love the wet and I have done numerous tandem battles in the wet but never on my current setup before! I drove out on the track and tired to initiate at my normal speed and aggression but only to have spun at the entry!! Thankfully I managed to avoid the wall.. That run definitely didn’t do much for nerves! All I could do was grit my teeth and hum the theme song to ‘Barney’ to calm my nerves…. Top 8 was against another top Singaporean drifter Jensen Tan. Jensen Tan is an animal of an opponent. With his circuit racing experience I knew it wasn’t going to be easy. I somehow managed to do both runs without any major corrections and advanced to top 4. At the lead I knew I had to go all out , I entered the first corner as fast as I could but I gingerly dumped the clutch when it came to initiation! To my suprise the car didn’t respond as I expected and just went straight. I dumped again ,harder this time, and managed to stick the tail out. But this has caused me to go slightly off line when suddenly the front tires just washed off and made me spin!! I was filled with mixed emotion, I was sad I was not able to put up a good fight with Djan but then I was happy to at least be able to share the podium with him. Team mate Johan Norman managed to breeze his way to the finals and and bagged 2nd spot, which was a fantastic for Goodyear!! Djan laughing when I told him that the ‘Thumbs Up’ sign meant Goodyear!! It was a pleasure to have met Tony Angelo and Jarrod DeAnda. Tony even volunteered to help fix Jane’s car after her crash!! Andy Yen was the one who encouraged me to qualify last year despite of my mechanical problems and it made me more deterimine this year especially when things didn’t go my way through out the weekend! Thanks Andy ..Go Go Corollas!!! Melissa Fong. She flew down from Malaysia and was with us through out. She was our spotter during our practice runs and made sure we were never hungry nor thirsty through out the day. She got burnt badly from standing out in the sun too long . We both can’t thank her enough for what she has done for us!! Ah Leong , a friend and owner of WHAT Motorworks, the guy I throw tantrums at and blame whenever there’s no one else for me to blame. I’m glad the car performed flawlessly through out the weekend. Sure we had teething problems the whole of last year but I am sure it is all behind us.Thanks for staying up all night back at the workshop and eating the fried rice and one fried egg I tapaued for us. We will be posting all the pictures in the Forum section once I get them sorted out…keep a look out for them!! This entry was posted in Formula Drift, Goodyear and tagged drift, Drifting, fd singapore, formula d, Formula Drift, formula drift singapore, singapore drift on July 11, 2009 by skagee.